3D animation is the secret weapon in your content marketing arsenal. It makes it possible to demonstrate your product in ways that text, images and traditional video just can’t do. With 3D animation you can pack information into easily absorbable, memorable and engaging content, which will entertain your customers and help to drive your sales. The nature of immediacy in our digital world has led to a higher demand for concise content. Customers are also calling for information to be presented in a more interesting and engaging way. With more distractions, more information and shorter attention spans than ever before, there’s competition for every single piece of content that you create. This is why it’s so important for your content to stand out from the crowd. Everyone is doing images, be different. Being able to capture your customer’s attention means you’re halfway to winning them. Videos are a great way to grab your audience’s attention, and people are 4 times more likely to watch a video about a product than they are to read an article about it. 3D animation provides a detailed visualisation of your product which can hold people’s attention for longer compared to 2D animation, images or even live video. A big strength of 3D animated video is that it’s highly visual and auditory, which makes it easier for most people to remember than text based content. Powerful videos provide your viewers with a quick, convenient way to learn information, as opposed to print, which demands more time and concentration. 3D animation is still a pretty unique technology in content marketing. Thus giving it a greater capacity to attract huge traffic and grab your customer’s attention. The more attention-grabbing your content, the more chances you have of getting a conversion. Let’s be honest. People hate reading when they don’t have to. Where both video and text are available on the same page, 72% of people would rather use video to learn about a product or service. 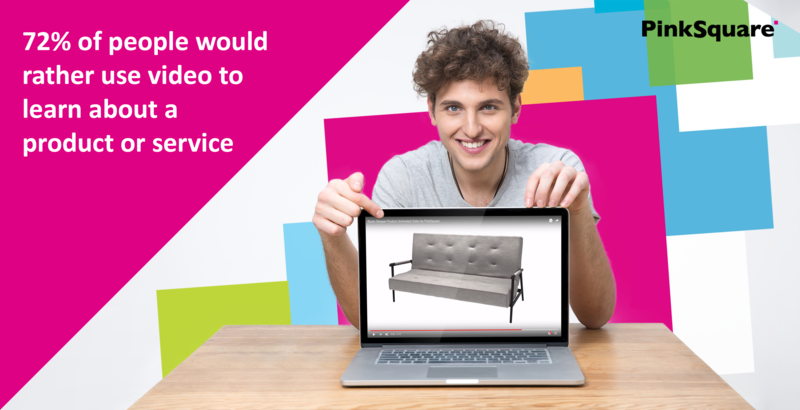 Video animation adds tremendous value to our experience as customers, and a better user experience means more sales! Statistics show that more than 80% of customers buy a product after watching a video about it. Video content is preferred over written content simply because the human brain processes visuals faster than text. Products with the addition of 360 degree animation in product pages has led to a 20% increase in conversion rates for those pages, and a significant reduction in product return rates. Your customers want to see more of your product. They want to be able to visualise themselves using it. 3D animation allows your customers to see every angle of the product as if it was right in front of them. Think about how we would turn a new phone over in our hand or walk around a car when considering a purchase. 3D animation lets your audience take a look inside your product when that view was never possible before. It even gives you the opportunity to show a product that hasn’t been built yet. We want to do more than watch how a product works. Consumers often want to see it inside and out. Consumers are used to viewing products from afar or via a human demonstration. 3D animation puts them in control and removes the distractions. Trying to explain a difficult concept? Animated videos are a great way to do it! More complex products aren’t clear from just a picture. Sometimes the value is in the detail. Seeing a product from all angles might work for something that fits in your hand but what happens when you need to view a large piece of machinery or equipment? Showrooms are expensive. Sending a sales person out to run a full product demo can be time consuming. Letting the consumer drive the sale is the future, by giving them the ability to explore the product in greater detail using 3D. The happiest customers are the ones that are most educated and those that have the deepest understanding of what they’re getting. If you have an amazing product wouldn’t you want to expose the world to it from all sides? If product designers have done their job correctly, there should be no reason to avoid letting your product be viewed from all angles. The ability to see through angles or beyond what is possible is the difference between a convinced customer and one that goes away in doubt. How can you show the inner workings of all products with limitations of photography? You can’t. With 3D animation you can. 3D Animation is a highly effective way to create engaging content. And the good news is, when your audience is engaged they are more likely to stay on your website for longer. A video on your company landing page means your visit times can increase from 8 seconds to beyond 2 minutes. That’s quite a jump! It’s also enough time to get your message across to your audience. The longer people stay on your site, Google considers your page to hold ‘high value content’ which means it’s great for improving your SEO. A lower bounce rate also means your visitors are spending more time engaged in your content. You want to give every visitor as much information as possible to make a buying decision. 3D animated videos increase conversions because they allow people to see and understand your product, which means they are far more likely to buy it. Sight and sound create powerful emotions that push people towards an action or purchase more than just words alone. The best way to grow and increase sales is to reach out to your customers with engaging, memorable content. 3D animation is an easy, fast and affordable way to create great video content. 3D animation is an efficient and cost effective way to create engaging and professional looking video content. Tell your story exactly as you’d like it to be told without having to take the time and expense of setting up scenes and using actors. With 3D animation 4 screws can wind themselves into a block of wood without a human having to tighten them. This eliminates the distraction of hands getting in the way. They can also do this simultaneously, taking a fraction of the time that it would take to do in video. 3D animation can bring concepts to life that no text or live video can and it is relevant to whole host of industries because it can be used to promote, demonstrate or to simplify your product. It can communicate your message clearly and leaves no room for misinterpretation. 3D animated video marketing is one of the few types of online content that provides real value in terms of clarifying a product. Removing doubt in terms of how something works is one of the few barriers between hesitation and purchase. More and more companies are using video and 3D animations everyday to boost their conversions and sales. But there are still lots of people with the misconception that purchasing animated content is hard work or too expensive. Well that isn’t always the case! Here are some of the main myths about 3D animation debunked. The 3D animation industry is evolving. It’s now becoming much faster and easier to produce 3D and therefore cheaper to purchase. 3D animation can now be bought online by people with no experience of the 3D industry and without the need for time consuming meetings, briefs and storyboards. Sometimes you can’t get the right view of how your product would look to rest of the world because you’re often too close to the project. Think like your customers. How would they most easily be able to view every angle of your product? Now you know about the “whys”, here’s the “how” to buy 3D animations. Many 3D animators are expensive and often hiring a full-time employee isn’t a good fit for a one off animation. Ensuring quality and getting the opportunity for revisions can be tricky. These guys are often up-and-coming artists without the processes or skills to put out high-quality animations. Find an agency or resource with a proven track record. The best company to choose for 3D animation projects is often the company with the most experience at the most reasonable price. PinkSquare specializes in providing a streamlined way to purchase 3D animations. They’re able to produce 3D Product Animations for ½ the price of most companies due to the volume and experience of their team of designers. They work with small and medium sized businesses in a number of different industries. Find out more. When it comes to content marketing it’s more important than ever to be different, because there’s so much content to compete with online. If you want to get your message heard you need it to stand out. 3D animation lets your product be seen in ways and from angles that have never before been possible. It provides information in an concise, entertaining way which is easy for your audience to digest and remember. Making them far more likely to buy your product. Plus, despite what some people may think, 3D animation is actually cheap and easy to produce. 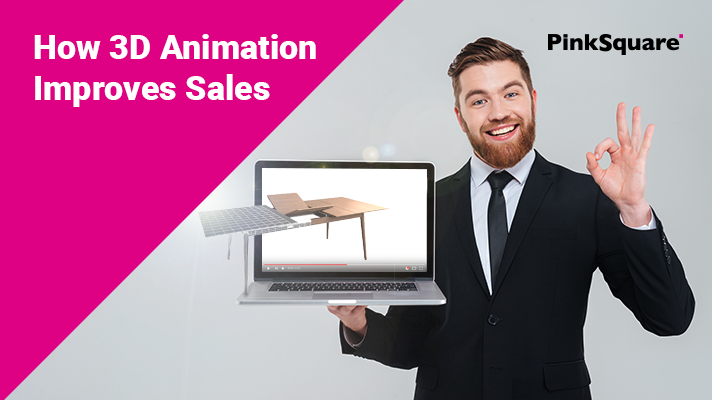 If you haven’t already starting using 3D animation to improve your sales the next step is up to you. You can either a) Continue doing what you’re doing without any significant results b) Try an “out of the box” new trend as a marketing strategy and risk losing time and money c) Use 3D animation to get it right. Emma Conlan is a marketing professional from the UK, currently living and working in Copenhagen. As a member of the PinkSquare digital marketing team she creates and promotes quality content.